Two weeks ago I went on a trip to Enchantment Lakes. This is an area not far from where I live. It is high in the mountains, isolated and beautiful. The last two are the reason why so many backpackers want to get there. In fact so many that there is limited number of permits given each year. It helps protect fragile unique ecosystem of the area. For three years I’ve been trying to get a permit to backpack to Enchantment Lakes during peak fall color of larches growing there. Finally, this year I got it. Right before going to the Enchantments I got cold. But that would not stop me. The forecast was for rain. That would not stop me either. I just got more rain gear with me. As I was walking up to Enchantments I met many people coming down telling me that there had been snow the night before. Everyone was leaving. And I was getting more excited. Snow in Enchantments – it must be beautiful. When I got to Enchantments the snow is mostly melted. The larches were beautiful – at the peak of fall color. I was the only backpacker there. The first night was very cold but the next day was calm and warm. The second night I learnt what winter storm meant up in the mountain, up in the Enchantments. It was freezing. The wind gusts were so loud they would wake me up. There was heavy snowfall. I had to push snow off the tents walls, so my tent would not collapse under its weight. Finally by the morning it quieted down and I could get some restful sleep. I worried about getting back the whole night. But when I got out in the morning and looked around it was amazing. I laughed like crazy, the beauty was overwhelming. Fresh white snow, not touched, not stepped on, all around. Yellow larches. Cloudy sky with glimpses of blue. I forgot about all my worries. I forgot about getting back. I beheld the most amazing sight in my life. There are a lot of photos to work thru now but the most important thing I took with me is an amazing experience. For now here are some images of my tent as it went thru me stay there. When I got back to civilization I had strange feeling: the world of cars and buildings did not seem to be real. It took days for realities to shift around. By now couple months after the trip the reality of the trip seems to be elusive. The only proof of it ever happening are the photos that I brought from the trip. This was my first backpacking trip. Would I do it again? Absolutely! I did like backpacking and photographing a lot. Being in one place with a mobility limited to human abilities was a great way to study one place very-very deeply, look at the same place in different light, let the place sink into me. Backpacking opens up new possibilities of photographing distant places that can only be reached on foot. I would certainly be more prepare next time. There is a lot of weight I could shave off from my backpack by bringing lighter clothes and equipment. At the same time I missed a few things from my backpack: mineral salts to add to drinking water, high calorie food, better first aid kit, more better batteries for my camera. I needed a different backpack too – it should be more sturdy, better fit, and with many different compartments, so I can reach different items without unpacking everything. It would be better to have camera bag, so I could quickly reach for my camera to take photos. It would also make my backpack lighter. 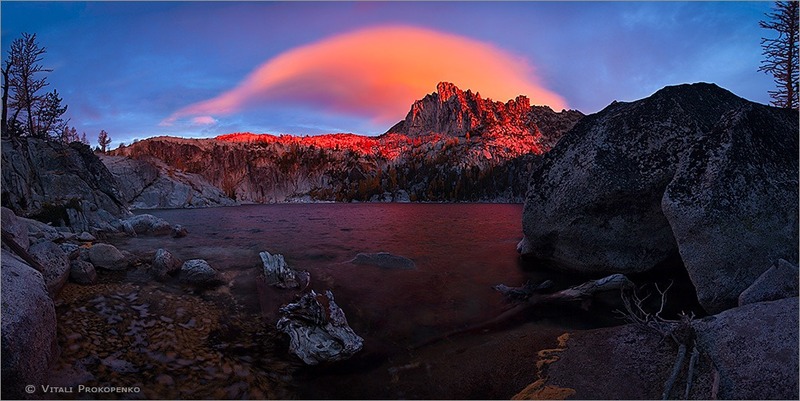 I hope all of you will have a chance to visit this magical place – Enchantment Lakes. Just leave as small imprint of a human on it as possible, let the others coming after you enjoy it too. Happy backpacking! Our 5 day trip to Enchantment Lakes was over. It was time to go back home. After photographing sunrise we packed up and started our descent. What a difference the 5 days spent in Enchantment Lakes made to the outside world! When we were hiking up the trees and shrubbery around us were green. When we were hiking down we discovered that they turned all kind of bright colors: yellow, orange, red. it was a feast for our eyes. We had a goal in site: home. So, we’ve made almost no stops on the way down. It took us more than a day to get all the way to Lake Viviane. It took us only 5 hours to come down from there. When we got down to the parking lot I was overjoyed that I lived thru such an experience. I was screaming out of the top of my lungs with joy and happiness. What an amazing trip! Josh woke me up way before sunrise as I asked him last night. He was the only one with an alarm watch. I was hard to wake up. Morning sleep is the sweetest sleep of all! Especially after night with wind gusts waking me up every now and then. Over night clouds moved in. This was great for photography. It was our last sunrise at Enchantments. I tried to wake up John but he refused. He was tired and sick. It was still dark but I saw some color in the sky and took a few long exposures. I saw on the back of my camera that the sky was already red. I showed it to John and that woke him up. He went on with his plan to climb back up to Core Enchantments. And on the way there he made one of the best photos of the trip. I went to the spot which I found the night before. The sunrise was blocked off by a small ridge on the right but I did not count on it. I was counting on Prusik Peak lighting up and photographing its reflection in Lake Viviane. Unfortunately the wind was still strong and the lake was unrestful. There was no reflection and the sky remained dark. For our last night at Enchantment Lakes we setup our camp by Lake Viviane. At first we set it up on an open area by the lake. But the wind was picking up. After some discussion we relocated the camp to a site where big boulders and trees were shielding us from the wind. We’ve made a really good choice. Later, before going to sleep, I wanted to setup camera for another long night exposure. Once I stepped out of our camp site I felt the strength of the wind and decided not to leave camera out on tripod out of worries that the wind would knock it over. By the last night at Enchantment Lakes I finally figured out the right combination of clothe, sleeping mat pressure, face cover (from freezing air) to get a good sleep. I dropped off to sleep quickly. I was woken up in the middle of the night by the wind gusts that were squashing down our tent. That was inside our camp site protected by boulders and trees. Outside the camp the wind was roaring. I fell asleep just to be woken up again and again by the top of the tent squashed onto me by a wind gust. By the morning wind quieted down a little bit and I fell in deep sleep. After yet another lunch out of freeze dried bag we started moving back home. The goal was to relocate our camp back to Lake Viviane where we would spend photographing sunset and sunrise. There was one big challenge for me on the way to Lake Viviane. At one point we needed to walk down a face of big boulder. With each step the slope was getting steeper and steeper. And the only thing that the one walking down could see was an abyss of the valley far down. I’m afraid of heights. This place got me worried even when we were walking up. But back then I just put those worries in the back of my mind until we would head down. Now it was the time to fight my fears. My first attempt was unsuccessful. Midway thru I panicked and turned around trying to get down on all four. Which turned both scarier and riskier. It was scarier because I could not see land under my feet at all. All I could see was the valley below. And it was riskier because I did not have full foot traction and could slid down. Josh and John told me to climb back up. I obeyed. Josh offered me to help with backpack and I handed it over to him. While Josh walked down with y backpack I did breathing exercise to calm myself down and restore oxygen balance (I was hyperventilating at that point). The exercise was surprisingly effective and in about a minute I made second attempt. I chose slightly different path that I was more comfortable with. I was looking strictly down to my feet. That helped and I got down. We had big hiking and photographing plans when we would get to Lake Viviane. When we actually got there we realized just how tired we were. I felt tired because I did not have enough calories in my food. As strange as it may sounds I had to bring more deserts, candies and other sweet things. John got sick. Josh was the only one that had energy to move around. He went to yet another lake while John and I stayed by Lake Viviane. I found a small niche where I could photograph reflection of Prusik Peak in Lake Viviane. After taking a few photos with the last light of the sun I took off my clothes and plunged into the lake. The water was icy cold but after four days of sweating it felt nice and refreshing. When I got out I put on fresh clothe getting ready for descent on the final day of the trip.